Using medicated chocolate for your Valentine’s Day desserts makes dosing easy. Infusing this decadent mousse pie with Seattle’s gourmet, low-dose Proper Chocolate along with potent cannabutter creates a memorable, beautiful indulgence that enhances sensual moods. Available in Washington State, Proper Chocolates contain only 5 milligrams of THC each. 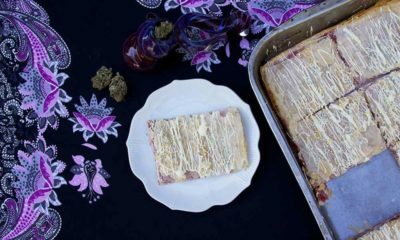 Ten milligrams is the recommended dosage per serving for someone with a low tolerance or who is new to edibles, so you can be flexible with the amount of THC in this recipe to individualize your dose. Use regular butter instead of cannabutter when making the crust for a less potent pie containing about 5 mg THC per slice, or garnish with two Proper Caramelized Whisky Ganache Chocolates, each containing just 5 mg of THC. As always, when using homemade cannabutter, the potency of the finished dish will depend on the THC content of the infused butter, so be cautious and remember to wait at least two hours to feel the full effects. When choosing cannabis chocolate for desserts, look for a reliable brand with great ingredients. 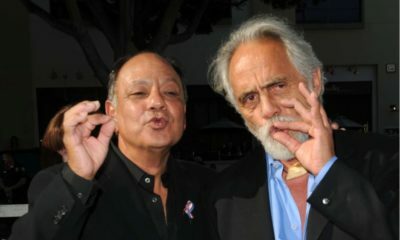 Botanica launched in 2014, with Spot Edibles as their first product offering in the early days of Washington State’s legal recreational cannabis market. Since then, they’ve grown into a a two-state operation and a family of five brands: Spot, Moxey’s Mints, Journeyman, BOND Sensual Oil and Proper Chocolates, with over 40 products currently offered. Lena Davidson, spokesperson for the company, is passionate about what Botanica SEATTLE creates and how important it is for pioneering cannabis companies to set the right precedent for users new to recreational marijuana. Customize your THC dose with this recipe for the richest chocolate dessert you’ll ever have! The “Proper” in Proper Chocolate’s name refers to the way in which each edible is carefully handcrafted, with an emphasis on the quality of the experience, from a decadent taste to the terpene-tailored high. Partnering with Olympia, Washington farm Raven Grass, Proper’s talented chocolatier Hilary Brown created two flavors of strain-specific truffles, with a level of attention paid to each handcrafted treat that artisanal confectioners worldwide would applaud. The flavors of the Proper Reserve Afgoo Caramelized Whiskey Ganache and the Dutch Treat Wild Strawberry Creme were designed to “match the terpene and experience profiles of each phenotype. The results are mouth-watering!” Davidson enthused. 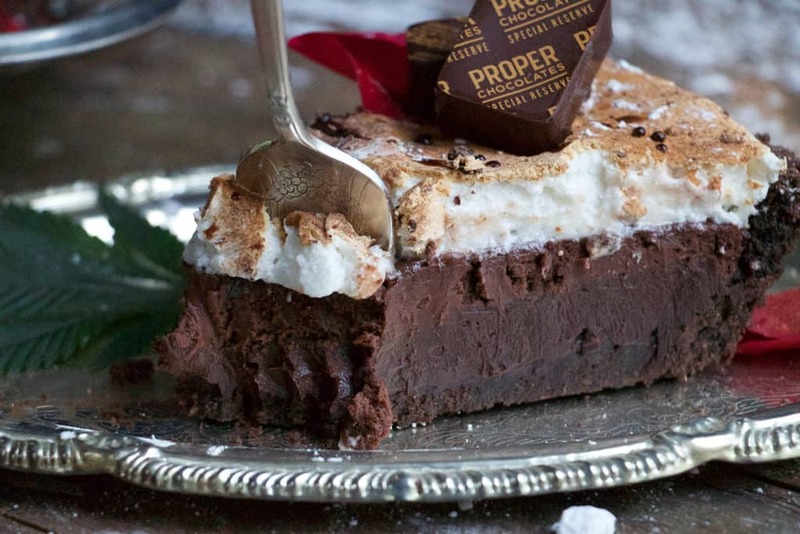 Topped with toasted meringue, the pie has a chocolate graham cracker crust, with layers of chocolate ganache and mousse. Gather your ingredients first, and let the cream cheese soften to room temperature. Use a food processor to make graham cracker crumbs. In a food processor, crumble the 2 packages of graham crackers. Pour into a medium bowl. Add the pinch of salt and melted 2/3 cup cannabutter, then mix together until butter is evenly incorporated throughout the graham cracker crumbs. Press the crumbs into an even layer in the pie pan. Press into your 9 to 10 inch pie dish, using a tart tamper or the back of a measuring cup, to shape a thick, firm crust. Refrigerate the crust while assembling the ganache. Chop your 5 oz of dark chocolate to make the incorporation process easier and to help ensure a smooth ganache. Place chopped chocolate in a heatproof bowl with the pinch of salt. Place bowl into a shallow water bath, in a saucepan over very low heat, stirring slowly to melt chocolate without getting it too hot. Warm the cream on the stovetop. In a small saucepan, heat the one cup of heavy cream until it just boils, over medium heat. Pour the hot cream over the chocolate and let sit for 5 minutes. Whisk the cream and chopped chocolate together. Then, gently whisk the chocolate mixture, starting in the middle, until you see the ganache begin to emulsify. Then slowly whisk in larger circles, until the ganache is smooth and silky. You don’t want to whisk vigorously, as you don’t want to incorporate any air into the mixture, so stop as soon as there is no visible cream. Add the 2 tablespoons of whisky and slowly whisk, from the center and working outwards in larger circles, to incorporate into the ganache mixture. If the ganache breaks, add a little bit more cream, and gently stir to incorporate. Pour the ganache into the pie pan. Pour the ganache onto chilled crust, and spread evenly with a small offset spatula. Set aside a small amount of ganache for drizzling on individual slices when serving. Chill while you make the mousse. In a bowl, add the 8 ounces of cream cheese and ¼ cup powdered sugar. Beat on low speed, until whipped. Add melted chocolate to the cream cheese mixture. Melt your chocolate: Put the 5 ounces of dark chocolate and salt in a heat-safe bowl, then put the bowl over a pot that has about 1 inch of simmering water in the bottom, to gently melt the chocolate. (Alternatively, use a double-boiler, or something similar to a bain-marie.) Stir the chocolate constantly until it has completely melted, but is not hot. Pour the melted chocolate into the cream cheese mixture. Beat to incorporate the chocolate on high, until light and fluffy. Spread the mousse over the ganache layer. Stir the 4 chopped Proper Caramelized Whisky Ganache Chocolates into the whipped mousse to distribute evenly. Spoon the mousse over the chilled ganache layer. Chill while you make the marshmallow meringue. Meringue requires intense whipping, so use an electric mixer if necessary. Place the 4 eggs whites in a heatproof mixing bowl. Make sure the bowl is very clean, because any stray fat will keep the meringue from whipping properly. Whisk the egg whites and ¼ cup powdered sugar into stiff peaks, which can take some time and serious effort by hand, or use an electric mixer. Whisk until the egg whites have expanded to about 4 times their original size. (If the egg whites just aren’t whipping up into stiff peaks, add a pinch of cream of tartar to stabilize the mixture.) Add the teaspoon of vanilla to the meringue mixture. Continue to whisk to incorporate fully. Spread the marshmallow meringue over the top of the pie. Immediately spoon the marshmallow meringue on top of the chilled pie with an offset spatula to create peaks and valleys. Toast the marshmallow meringue layer using the broiler in your oven or a dab torch. To toast the meringue with the broiler, the pie needs to be very close to the oven’s top heating element. Use a torch to toast the top of the meringue, or stick under the broiler for a few minutes. I left the door open, and moved the pie around to toast evenly. Finish toasting the peaks with a dab torch, for maximum caramelized meringue crispness. Decorate with the reserved Whisky Ganache drizzle, and serve. Can be enjoyed immediately, or refrigerated for up to 3 days. Note: I used cannabutter measuring at 1400 mg THC per 1 cup butter, so 2/3 cup cannabutter in the pie crust is roughly 933 mg THC, combined with four low-dose Proper Chocolates mixed into the mousse layer adding 20 mg THC. Cut into 8 slices, you’ll have about 119 mg of THC per slice, and garnishing with two Proper Chocolates brings the grand total to 140 mg THC.